Question: What about Male Belly Dancers? POSTING: I live in the midwest, (Lincoln Nebraska) saw female belly dancing at an Art gallery opening that I belong to, inquired about male classes, and the troupe is thinking of starting a men only class, I am very interested in learning all I can about men belly dancers, photos articles etc. I discussed martial art techniques and similarities ect and found there are very similar depending upon style...( I am a praticing Okinawian Go Ju Ryu Karate sempai and want to integrate karate movements into dancing....) - ANY help/info will be greatly apreciated. Anyone with information PLEASE email me at Wiggetb@yahoo.com. Question: "Hi there! I was invited to a fancy dress party. But my partner needs to be dressed accordingly! Please could you help regarding an outfit for my boyfriend? 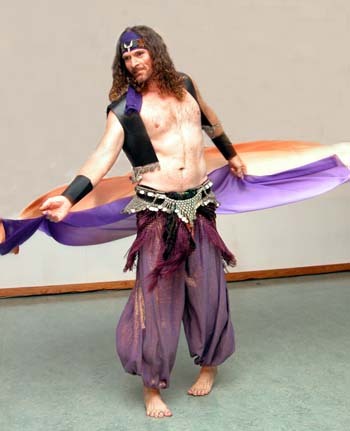 Thanks, Bronwyn James"
Reply: "Belly dance costumes for men! What a striking image that request conjures up! Depending, of course, on the venue, it can be very basic with harem pants, a fringed hip scarf, full sleeved shirt or tunic, and maybe a vest to top it off. The costume can be created from different FABRICS to change the look. Basics, again, would be the simple, natural fabrics. Rayons, lightweight cottons in solid or ethnic looking patterns all make splendid combos. Make the vests and belts from flexible upholstery yardage, and you'll be surprised at how it adds texture to the look. Step up the glitz with shiny fabrics, including lame's and jersey lame's, sequined fabrics, or fabrics with metallic threads. Add coins as trim, and, closely sewn together, for SOUND - great addition to the belt and the vest. Another terrific costume pairing - loose caftan toparem pants, with fringed hip belt on top. Striped fabric caftans have that ethnic look; shimmery metallics are great stuff for cabaret. Toss in a twisted fabric headband across the forehead, (or turban, if you're really into it), and the look's complete. Plain or fancy, you can make the male dancer a treat for the audience's eyes! And we all know, you just dance better when you're in costume....."
ANSWER: FROM Catharae: "Hello Erica - and Joel, Let me address your question regarding male "belly dancers" - Not only is there such a thing as male dancers, but there a several famous and popular dancers right here in America. The dance is, of course, derived from a culture in which men, women and children all dance. The fact is that they may not dance at the same time, in the same settings, but they do dance with the same fervor and expression. One understanding is that the term "belly dance" may have been a derivation of the word "beledi," which refers to that which comes from the "people," the folk of an area - not only the women, but ALL the people. Culturally, men are shimmiers too! Immediately, I see in my mind all the men I have enjoyed as dancers in the past few years: Horacio Cifuentes of Germany (husband to dancer Beata Zadou); Kamaal of Southern California; Aziz of Utah; Farnoush of LA (now); Bert Balladine of the past few decades; John Compton of Habi Ru in Northern California; Momo Kadou who also dances with his beautiful wife; Hassan Deeb of Northern California; and friends I love to watch - including Daveed of Van Nuys. How many have I left out...? Point is - they are everywhere. These are only the dancers that I have seen, known, can remember! You write that you have no idea about instruction. Let me make this suggestion: Don't wait. Join a predominantly female class, and get started. Many teachers have little experience teaching men, but can give the basics that can be adapted to the body, as necessary. Some prefer to grant men an angularity to their posture, that does not translate to the women in class - i.e., keep fingers close together, arms straighter/less curves. Get going! Remember that not all women look the same, doing the same movement, learning in the same class; so shall the dance settle onto your body in a way unique to yourself. Keep an eye out for workshops. Don't be intimidated, and think you must have some degree of expertise in the dance, in order to attend. If you observe, and participate, you will learn. If you take away one important step, concept, combination, from a workshop, consider it a successful venture! I know Aziz travels and teaches; so do many of the others I have cited here. Organizations in the dance, such as MECDA and SAMEDA here in California (and soon in Oklahoma! ), WAMEDA in Washington, all offer events that sponsor dance teachers. Contact your local belly dance organizations, or contact these on the West Coast, to find out what is coming. Try Morocco in New York who conducts her own, widely respected conferences. She is in close contact with another (male) professional dancer, Tarik abdel Malik, who has written an article about male dancing, visible on her website. The dance form is represented in videos! You may certainly buy instructional videos by Horacio (Egyptian style), as well as many performance videos by the others, from which you can glean tips and info. I have several in my collection of dance videos. John Compton's Habi Ru performances from the Northern California Renaissance Faire are fabulous - and the costuming, as well as the dance style, is completely different from Horacio's - yet the basics are all there. Many vendors of videos are on the internet - and many can answer your request for men dancers. Search on your own, or email me for vendors that I have used successfully. Your husband has much to choose from - he doesn't have to try to only learn "cabaret" style dancing that we have all seen in the clubs. Within the dance itself, you have options: Arabic cabaret, Egyptian Raks (Sharki, Tathib, etc), tribal, ethnic. Some of my favorite performances have included the balancing skills (trays with lighted candles, or cups and decanter, swords), double veil with spins to faint from, endless drum solo shimmies. One friend of mine dances locally, and is a real treat to watch, simply because he loves to dance for us! All of these reflect the power of grace - which I find pleasingly enhanced by the power of the male body. The very concept of men performing belly dance can stir a controversy. We've always been active in trying to dispel the various myths and stereotypes which prevent the art from receiving the recognition it deserves for women. But there is still an important area which has been consistently overlooked: the role of men. Men are a refreshing addition to belly dance. Choreography for a dance routine can be enhanced with a male dancer. Some men tend to make every move strong and masculine while others may move exactly the same as women do. Whether you are male or female, everyone has their own style. Reasons men are belly dancing these days include fascination with Egyptian music, a great way to work out, and yes, a perfect opportunity to meet lots of beautiful women! Belly dance is a delightful experience that can easily be shared by both sexes. While their interpretations may vary, there is no doubt that they dance with the same enthusiasm and passion.